I don't think that the phrase 'pop-punk' meant quite the same thing in 1995 as it does today. It certainly didn't have the sort of negative connotations that some people associate with the genre. But I think that most agree that the mid 1990's was a different time and a different place. Back then you would hear people extolling the virtues of Screeching Weasel, The Queers, Green Day and the Mr. T Experience. But for me, my holy trinity of 1990's pop-punk would be the aforementioned Mr. T Experience, Zoinks! and at times the best of them all, Sicko. I've had the American version of this record since the very moment it came out in 1995. I remember counting down the days until it showed up at my local record store. I loved it from day one. So it's kind of cheating to write about it here and now on my website where I'm documenting recent purchases. Although, since this is the Japanese version and I did just get it from a friend that was downsizing his physical record collection, I'll use it as an excuse to tell everyone that if they don't already own this album, they should fix that oversight immediately. I go back and forth on if this is my favorite Sicko album, of if it's Laugh While You Can Monkey Boy. Let's just agree that both are pretty spectacular. 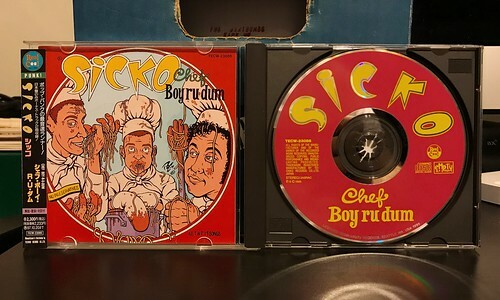 Chef Boy R U Dumb is packed full of gleeful and catchy punk rock, highlighted by some songs that are among the best Sicko ever churned out like "Obsessive Compulsive Complainers," "The Dateless Losers" and "Escalator." The Japanese version of this release has a couple of bonus tracks (and the fancy obi strip seen in the picture). "80 Dollars" is originally from the Sicko split 7" with the Mr. T Experience. You could definitely argues it's one of the top two or three songs in the band's catalog. The other is exclusive to this CD, "The Rainy Day Song." This one is similar to "The Breakfast Song" in that it's just guitar, undistorted, and Ean crooning his heart out. Essential? Probably not, but a fun little bonus added on top of an already stellar album. No matter which version of this album you pick up, it is a pretty essential piece of the 90's that everyone should have. hi! is there any chance that i could get a flac/lossless copy of "the rainy day song"? i have everything by sicko except that song. i can trade you the bonus songs from the japanese or crackle versions of you are not the boss of me, if you don't have them. thanks!